If you are currently searching for a party bus in Luna Pier, then rest assured that your search has now finally come to an end. Here at Rockstarz Limousine and Party Bus, we specialize in providing our clients with an amazing experience from start to finish, and we can do this no matter the type of occasion that you and your guests are celebrating. 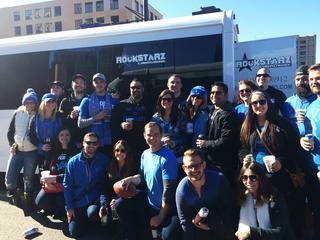 Whenever you are looking to rent a party bus, you will first of all want to know how many people you can invite along. Thanks to the way in which we have organized the layout of the bus, you are now able to invite even more people than ever before which means your party is going to be bigger and better than you ever thought possible. Our Luna Pier party bus rental option is designed in such a way so as to make you and your guests feel as if you are in your very own private nightclub. As you cruise around the city, you will be forgiven for even forgetting that you are on a party bus, and it is all thanks to technology that we have included in our service. From the state of the art sound system to the laser light display, the atmosphere that you and your guests will experience is unlike anything else. Throw in leather seats where you can rest as the party continues, and you have the ideal location no matter the occasion. Our Luna Pier party bus service is perfect for celebrating birthdays as well as a special anniversary. Also, individuals have used our service even for bachelor or bachelorette parties, and we can help you out each and every time. So, if you live in the Luna Pier area and are looking for a party bus, then give us a call here at Rockstarz Limousine and Party Bus. Alternatively, you can contact us via our website and someone will be in touch as soon as possible.